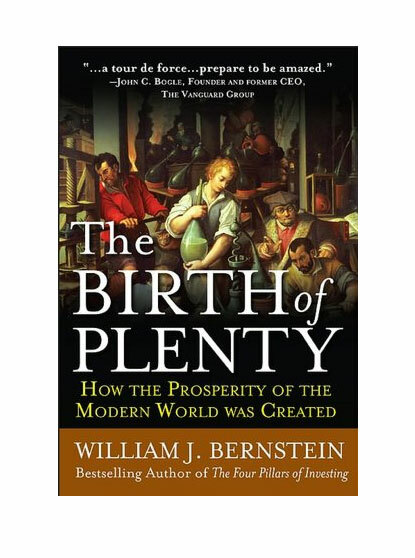 The Birth of Plenty: How the Prosperity of the Modern World Was Created - IFA Vintage and Current Book Library - Index Fund Advisors, Inc.
Rather than dry academic analysis, Bernstein, in his second book (after Four Pillars of Investing), has created a vital, living text-a cogent, timely journey through the economic history of the modern world. He identifies institutions ("the framework within which human beings think, interact and carry on business") as the engines of prosperity. Boiled down to four (property rights, the scientific method, capital markets and communications), these institutions come from ideas and practices that bubbled forth over the course of hundreds of years. Bernstein is clear in explaining that the civilizations that develop and implement these systems thrive, and that those that do not, perish.